Group 14 include Carbon (C) , Silicon (Si), Germanium(Ge) ,tin(Sn) ,lead(Pb) and ununquadium (uuq) which is radioactive. Carbon is the 17th most abundant element by weight in the earth crust. It occurs in the native state in form of coal ,graphite and diamond. In combined state it occurs widely as metal carbonates, hydrocarbons ,carbohydrates and carbon dioxide in air. Silicon is the second most abundant element by weight in the earth crust. It widely occurs in form of silica , and in a wide variety of silicates and clays. Germanium occurs in traces and is mainly recovered from flue dust arising from roasting of zinc ore.
Germanium and silicon are used to make transistors and Semiconductor devices. The natural abundance of tin and lead are 2ppm and 13 ppm. Tin occurs mainly as tinestone or cassitertite. The principal ore of lead is galena. Other words of lead are anglestite and cerussite. The general valence shell electronic configuration of elements of group 14 is ns2 np2 where n is the number of the outermost principal shell. The covalent radii of group 14 elements are smaller than those of the elements of group 13. Reasons: When we move from group 13 to group 14 within the same period ,the effective nuclear charge increases and hence the covalent radius decreases due to stronger attractive influence of the nucleus on the outer electrons. Covalent radii of group 14 elements regularly increases as we move down the group. Reason: It is due to addition of a new energy shells in each succeeding element. The increase in covalent radius from Silicon onwards is however small due to ineffective shielding of the valence electrons by the intervening d and f orbitals. 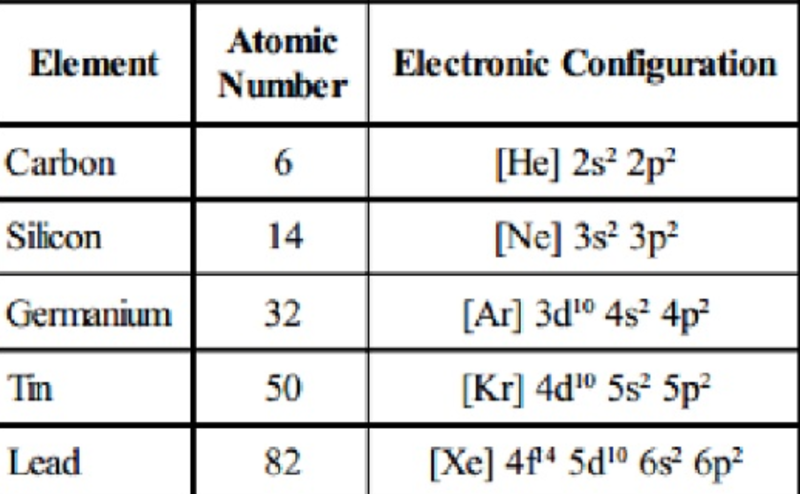 The first ionisation enthalpies of group 14 elements are higher than those of elements of group 13. Reason: Because of greater nuclear charge and smaller size of the atoms of group 14 elements. The first ionisation enthalpy decreases steadily on moving down the group from carbon to tin. The decrease is very sharp from carbon to silicon while there is a slight increase in the first ionization enthalpy of lead as compared to that of tin. Reason: The decrease in ionization enthalpy down the group from C to Sn is due to increase in atomic size and screening effect of the inner electrons which outweigh the effect of increased nuclear charge. The small increase in ionization enthalpy from Sn to Pb is due to a considerable increase in nuclear charge which outweights the shielding effect of all the electrons in the inner shells including those of 4f and 5d electrons. The elements of group 14 are more electronegative than group 13 elements because of smaller size. Electronegativity decreases down from Carbon to Silicon and remains constant from Si to Sn and then slightly increases for Pb. They are less electropositive and hence less metallic then group 13 elements because of smaller atomic size and higher ionization enthalpy. On moving down the group metallic character increases. Carbon is strictly non-metallic, silicon is non-metal , germanium is a metalloid where tin and lead are soft metal with low melting point. The melting and boiling point of group 14 elements are much higher than those of corresponding elements of group 13. Reason: The atoms of group 14 form four covalent bonds with each other and hence there exist strong binding forces between their atoms both in the solid as well as in the liquid state.The melting point and boiling point decreases as we move down the group due to corresponding decrease in the interatomic forces of attraction. I honestly thanks you for such a reasonable answer which helps me a lot to understand my concept clearly .